On the eve of twelve (plus) days of traditions, I figured that I better tie up a loose end. No . . . well, that might be because I did this gameboard months ago . . . promising at the end of that tutorial that I would be posting a game piece tutorial soon. (Here's the tutorial for the gameboard.) Apparently, in my world, soon is a relative thing. For example, "soon" could mean two months later. So . . . here are the game pieces that I did - on one side you can play tic tac toe with the bat and ball pieces and on the other side you can practice pattern and shape recognition the shape pieces. 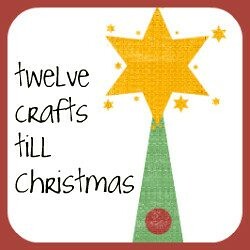 1) Cut out circles or preferred game piece shape to fit the size of your tic tac toes spaces . . . two circles per piece for ten pieces . . . 20 circles total. 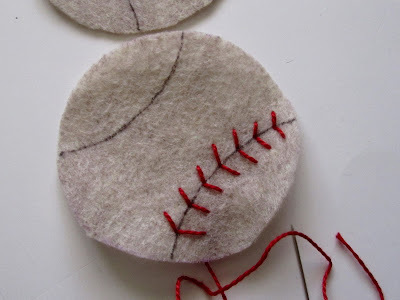 2) Draw baseball seams on one side of 5 of the circles with permanent marker and embroider over with a V-stitch. 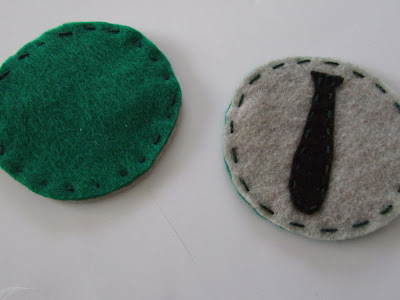 3) Use felt glue to attach these five circles to five other circles. 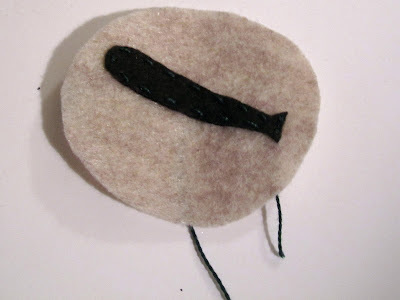 4) Cut out bat shapes from felt and use embroidery thread to attach to another five circles. (I used a pattern that I hand drew for bat shapes.) 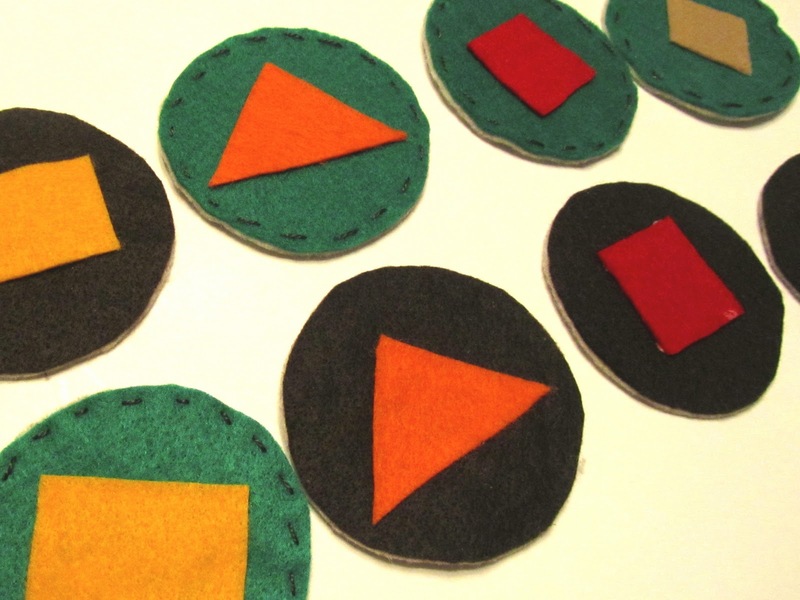 Use embroidery thread to sew these five circles to the remaining five. 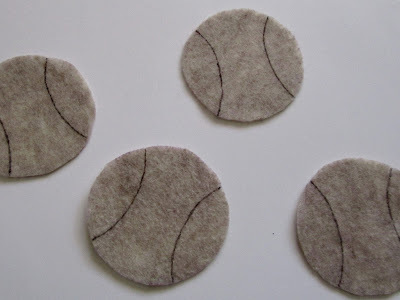 5) Cut out shapes in and use felt glue to attach to opposite sides of bats and balls. I matched these pieces with the theme of the fabric on the other side of the fabric gameboard. 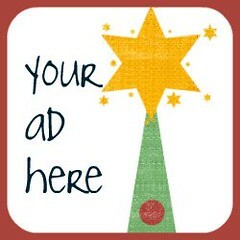 Use your imagination for your own pieces . . . options are endless. I will also be including a little "idea sheet" for matching and pattern games to play with the shape side of the game pieces. Wow! I love this, Elizabeth! This is a great gift idea for a couple of kids on my list. Thanks for the tutorials! Oh the baseballs. Too cute!! I love that they're reversible and you get two toys out of one! They are great, so it was a job well done, it was worth the wait! Very cool project. Me likey! And what a linky list - wowza that's a lot of parties! OMG I LOVE the baseball theme!!!! I would love to have you join me & link these up for my first party! 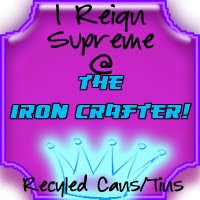 That is cute as heck! I am thinking of making it for Grandpa to keep around to entertain the kids. Thanks!